A compact all-in-one printer comes with a freedom to print high definition photos and documents easily to satisfy needs of the whole family. The Epson Stylus Photo PX710w has 2 paper trays that are used ideally for storing A4 size and photo-size paper simultaneously, so you do not need to worry about switching between the paper trays. The Epson Stylus Photo PX710w facilitates in providing high-speed printing of documents up to 40 ppm and 10 x 15 cm photo in approx 10 secs and comes with 6.3 cm LCD viewer for direct printing of photos from cameras and memory cards to produce lab-quality photos easily. The printer comes with dimensions 446‎ mm (Width) × 385 mm (Depth) × 150 mm (Height) and weighs 9 kgs which limit its movement from one place to other. The printer uses six colour printing system with separate Epson Stylus Photo PX710w Ink Cartridges for each colour and has Ethernet, and Wi-Fi capabilities for printing and scanning. The printer saves on paper expenditure by providing an optional auto-duplexer feature for double-sided printing. The Epson Stylus Photo PX710w printer amongst the range of photo printer is a machine that comes with attractive features like easy USB, Ethernet, and Wifi connectivity. It is a quick and easy to handle printer which produces excellent photos and works well for printing documents. What should be done if the prints obtained from the Epson Stylus Photo PX710w printer have poor prints? Use only high-quality Epson Stylus Photo PX710w Ink Cartridges and paper as recommended by Epson. When the printout is faint or has gaps? Use up the Epson Stylus Photo PX710w Ink Cartridges within six months of the opening of vacuum package otherwise, the ink may start drying out after the expiry date and will be of no use. Q. What all is provided in the box of the Epson Stylus Photo PX710w printer? A. The Main unit, Individual Epson Stylus Photo PX710w Ink Cartridges, Setup guide, Wi-Fi/network setup guide, User manual (CD), Software (CD), Warranty document and a Power cable is provided in the box of the Epson Stylus Photo PX710w printer. Q. Does the Epson Stylus Photo PX710w printer support printing on CDs and DVDs? A. Yes, this printer can directly print onto CDs and DVDs. Q. What modes of payment are accepted for purchasing Epson Stylus Photo PX710w Ink Cartridges from your website? A. You can make your payment using Laser Card, American Express, MasterCard or Visa credit card, Maestro, Switch, Solo or Delta debit card for Epson Stylus Photo PX710w Ink Cartridges. Q. 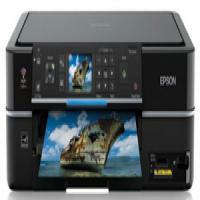 What operating systems are supported by the Epson Stylus Photo PX710w printer? In Windows OS, Windows 2000 and higher. In Mac OS, Mac OS 10.3 and higher. Q. I ordered a multipack of 18 compatible Epson Stylus Photo PX710w Ink Cartridges (T0807). When my order was delivered, I received just 17 packs of cartridges. What should I do in this situation? A. We are sorry that this extremely unlikely event has occurred with your order. Please call us at 048 30833221 or email us at info@printerinkcartridges.ie . Please inform us within 24hrs of receipt of the goods. Unfortunately, we cannot accept claims after that time. Q. Can I print photos using the Epson Stylus Photo PX710w printer? A. Yes, you can print photos using this printer. Q. Can I scan photos directly to a memory card without using PC? A. Yes, you can scan directly to memory card from the LCD screen on the printer without using a PC. Q. Does the Epson Stylus Photo PX710w printer support Wi-Fi connectivity? Q. Can I directly print images with Epson Stylus Photo PX710W printers without having to connect to a computer? A. Yes, Epson Stylus Photo PX710W printers come with a 6.3 cm LCD screen which enables the users to print directly from their memory cards or PictBridge enabled cameras without having to connect to a computer. Q. Will compatible Epson Stylus Photo PX710W ink cartridges work as well as the original ones? A. Yes, you can trust our compatible Epson Stylus Photo PX710W ink cartridges to work as well with your printer as the original ink cartridges. All our compatible ink cartridges are manufactured to work well with your printer and are FSC tested and certified. They will offer the same quality output as original ink cartridges. Q. How do I connect my Epson Stylus Photo PX710W printer to the Wi-Fi? Make sure that the Wi-Fi router is turned on and discoverable by other devices. Go to "Advanced Setup" and select "Manual Wireless LAN Setup". Select "Infrastructure Mode" and choose "Search SSID". Choose the network name to which you want to connect your printer to. Select the security method (WEP or WPA) of the network and enter the password. Once the completion message appears, click on "OK". Q. Do you also provide paper that can be used with Epson Stylus Photo PX710W printers? A. Yes we provide envelopes, A4 sized white paper, gloss photo paper and matt photo paper, that can be used with your Epson Stylus Photo PX710W. Q. I still have cyan and magenta ink cartridges from an old Epson Sx400 printer which I no longer use. Can I use these ink cartridges with my new Epson Stylus Photo PX710W? A. No, Epson Stylus Photo PX710W ink cartridges are not the same as the ones used in Epson Sx400 printers. Although the ink cartridges may look similar to the cartridges used in your PX710W printer, they are not compatible with it. Q. I am a photographer and I need a printer which can print high quality photos with low running costs. Is the Epson Stylus Photo PX710W suitable for me? A. Yes, Epson Stylus Photo PX710W is perfect for your needs. The PX710W printer can produce high quality, sharp and vivid photos. You will also save money on ink with our compatible Epson Stylus Photo PX710W ink cartridges as they yield a high number of pages and you only have to replace the ink cartridge of the colour that has run out. The printer also comes with PictBridge support, so you can print pictures directly from your camera. Q. How do I print borderless photos with Epson Stylus Photo PX710W printer on a Windows PC? Select the picture you want to print, and click on the "Print" icon. A window will appear on your screen allowing you to customise your print. Make sure to select your printer under the "Printer" drop down menu. Enter the appropriate print properties like quality, orientation, paper size etc. Then, select the "Borderless" option. Once all your print preferences are selected, click on "OK" and the printing process will initiate. Q. Do Epson Stylus Photo PX710W ink cartridges come with a warranty? A. Yes, our Epson Stylus Photo PX710W ink cartridges are warranted to be free from any defects. If you face a problem with any of our products, please contact us on 048 308332211 or email us on info@printerinkcartridges.ie regarding your issue within 30 days of receiving your product and we will be happy to help you. A. We usually deliver the products to our customers within 1-2 days, if they are ordered before 12 noon. If your order is urgent, you can reach out to us on 048 308332211 and we will try our best to deliver the product to you as fast as possible.